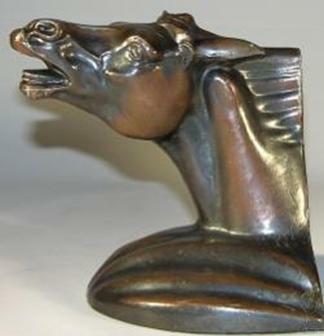 Neighing Horse – Manufacturer Unknown. Circa 1925. 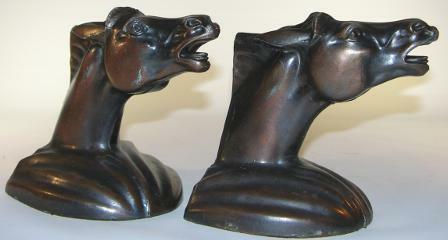 Gray metal with 2-toned bronze-copper finish. Measures 5-1/2” high x 4-3/4” wide x 5” deep. Weighs 4 lbs. the pair. Original felt bottoms. Pure deco lines demonstrating speed and motion. A few surface blemishes to finish. Otherwise excellent condition.